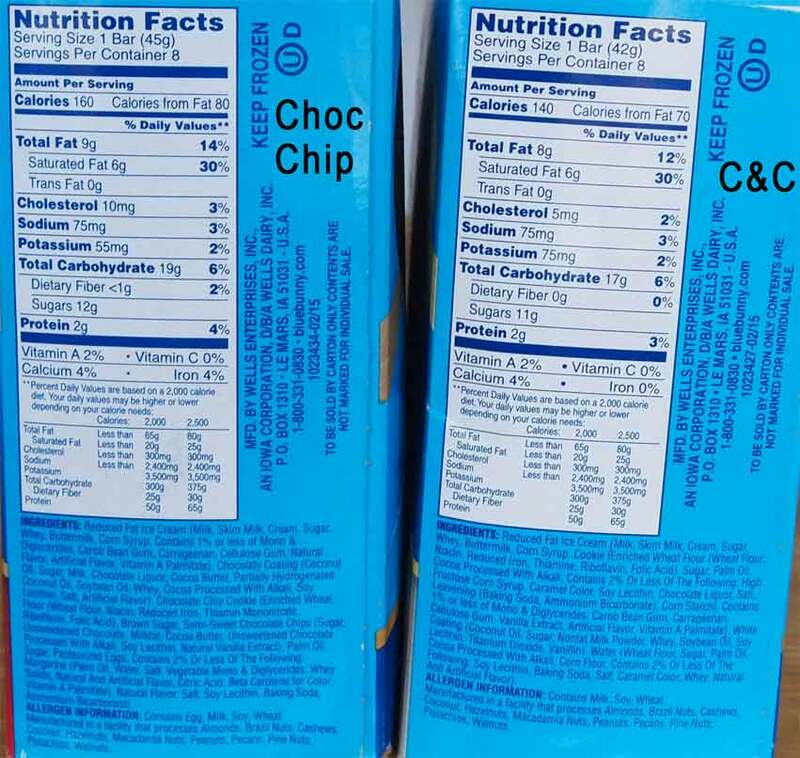 [2017 Update] They took the stick out of both of these as part of their new "Bunny Snacks" line up. 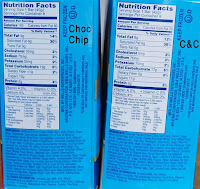 The C&C funwich is off their website but the choco chip one is still there. [2016 Update] They updated the packaging and the construction of these. They hold together quite well now and I've actually grown quite fond of them. I keep a pack of the chocolate chip in the chest freezer for whenever I need a fun quick treat. 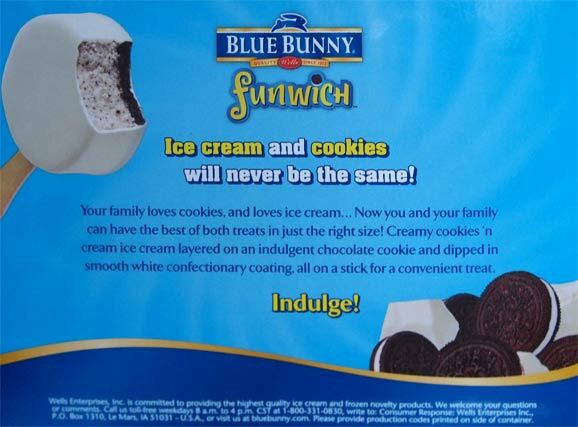 [New for 2015] Ever since I've seen the Canadian version of this idea made by Chapman's, I've always wanted to try something similar in the U.S. Years went by and then about a month ago, what do I see, but good ol' Blue Bunny finally cranking out something new for 2015. Whoa, they're pretty small. Apparently 2.3 fluid ounces only translates to 45g of physical weight. Think about that for a minute. 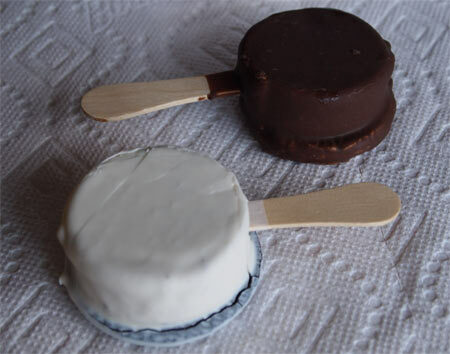 A small half cup serving of a lighter ice cream is usually about 60g. And look closely, the cookie is bigger than the filling. Uggggg. #FunFactor waning. I go with the choc first and and shocked at how hard the cookie is. Yes I like a nice texture in my treats, but with a shell so thin and the ice cream so light, you wind up plowing through the ice cream and then slamming in to the cookie. Ahhhhhhhhhhhh. Why is the cookie that thick? Filling is very bright white. Shell is... we'll stick with thin for now. Cookie does have a decent flavor but I think I taste coconut and that's not a positive. As I approach the C&C bar, I notice a smell of... something. Kind of like a cheap white chocolate I guess. Or maybe it reminds me of those odd Hershey's candy corn bars. Either way, I dig in and thankfully the Oreo-like cookie is much softer than the chocolate chip cookie.. This treat makes more sense in the variation but even now, the shell and filling seem too light in comparison to the cookie. I like the direction they were going here, and I like that you can see the cookie bits in the ice cream, but overall I am not impressed. Well, that was disappointing, but like I said, I've been thinking about these for years and there was probably never much chance of them living up to the hype in my mind (though overall Blue Bunny has an excellent track record with these things). Ok, stayed tuned for the next go around! On Second Scoop: Ok, lowered expectations definitely help, though I still don't get the "chocolate chip" version. The cookie is way too hard and reminds me of a crunchy oatmeal cookie more than anything. It also can separate from the ice cream if you bite it the wrong way. At least the coconut vibe is mostly gone. If I haven't scared you off, try the cookies and cream version first. It's decent but everything about it should be tweaked. There but not there. Too fake maybe? 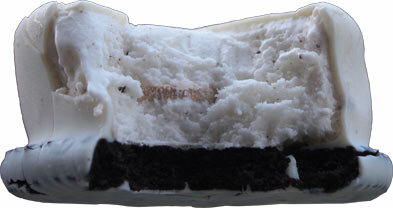 If anything, it reminds me of that time I dumped magic shell on an Oreo ice cream sandwich. On Third Scoop: Ahhhh, eat the chocolate chip version with the cookie on top, it seems to help. It is kind of growing on me, though I doubt I will ever truly understand it. Guess my quest to try an It's-It will have to continue. These look so good though. Oh well, guess I'll stick with Coolhaus for my ice cream cookie needs. Well, Kudos to them for trying something new... but I think I'll just stick to their minis line. Can't go wrong with a caramel mini. I'm not a fan of Blue Bunny Ice Cream. Too fluffy/airy. But....You've never had an It's It? Holy crap..